PLANET in PERIL, your "one-stop shop" for the truth about our planetary crisis. : "Bill 24 Stinks!" Manitoba Green Party Leader - James Beddome. "Bill 24 Stinks!" 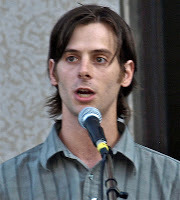 Manitoba Green Party Leader - James Beddome. WINNIPEG - Green Party leader James Beddome wasn't the least bit subtle Wednesday about what he thinks of the Pallister government's red tape reduction bill. Beddome declared to a rally on the steps of the Manitoba legislature. "It's part of a Conservative agenda that tells us all regulation is bad," Beddome said. "Government efficiency means don't do our homework; if there's no data, there's no problem." Environmental activists led by the Wilderness Committee and Hog Watch Manitoba protested Bill 24, an omnibus bill going to public hearings sometime later this month, warning that within its reductions to regulations were changes that would allow the expansion of industrial hog barns that would further jeopardize the health of Lake Winnipeg. - but did agree that lifting the former NDP government's moratorium on hog barn expansion will produce more toxins that will eventually wash into Lake Winnipeg. "We're not opposed to raising pigs in Manitoba," said Hog Watch head Vicki Burns, but it must be done humanely and without harming the environment. "We haven't seen the improvements in Lake Winnipeg we need to see," said Eric Reder, campaign coordinator for Wilderness Manitoba. NDP environment critic Rob Altemeyer accused Premier Brian Pallister of copying Stephen Harper's playbook, by packing so many issues into an omnibus bill in hopes some would slip by unnoticed. : Red-tape bill stinks, says Green party. antibiotics, growth- promoting chemicals and other veterinary drugs end up in animals themselves and enter the environment through their manure and urine, contaminating the water, the soil and our food. The social fabric of many communities has been ripped apart by controversy between opposing views of these operations. Hog factories can no longer be considered as farming or agriculture, or even agri-business. corporations to profit from consolidation and ultimately control the industry, at the expense of our environment and Lake Winnipeg. Unfortunately, the government of Manitoba appears to be in lock-step with the Industry at the present time. others to participate as well. Please do your part. Your participation is necessary and very important to "Help Save Our Lake".